There are many universities available already for international students, some of them are favorites. These universities, they offer various fields, majors and courses for prospective students. Many to choose from, so for guidance, do not forget to read the popular major and courses in Russian universities. And do not forget to pick the best city and scholarships. As one of the most culturally diverse countries in the world, Russia is an interesting destination to study arts and culture. For centuries the nation has contributed significantly in terms of arts and culture. Art schools and institutes have been established even earlier than science and research universities. Back in the day, royalties (emperor and empress of Russia), highly encourage education of arts, long before the science enlightenment era. 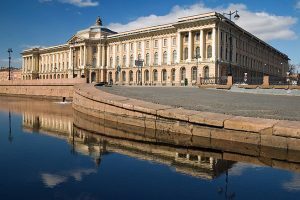 Locates in the historical building on the bank of Neva River, St. Petersburg State Academy for Painting, Sculpture, and Architecture is one of the most prestigious art institutes in Russia. It is also the top of 8 best university for Arts Degree in Russia. Its original name was Imperial Academy of Arts. The foundation was in 1757, therefore one of the oldest educational institutions in Russia. There are faculties of various art fields here: The fine arts faculty, Graphic arts faculty. Architecture Faculty, Art theory faculty. The institute also has a museum with a sizable collection. Some of the arts are donated from the Hermitage, while others are a generous donation and the founder’s personal collection. The Institute also has a library with half million of books, making it one of the largest universities library in Russia. Saint Petersburg Art and Industry Academy was established in 1876 as School of Technical Drawing. It changed name several times during the Soviet Era from Vera Mukhina Higher School of Art and Design to Leningrad Higher School of Art and Industry. But the underlying purpose of the school remained, it is a place to train students in art and design. The academy has 1500 students. Faculties are specified in arts and designs: Faculty of Design and Faculty of Monumental and Decorative Arts. At faculty of design, students study Fashion Design, Industrial Design, Graphic design, and many more. While at the other faculty, students study decorative arts such as painting, sculpture, glass, and ceramics. Kazan State University of Culture was originally a branch of Leningrad Institute of Culture. Founded by the Ministry of Art and Culture, it retained its independence in 1974. After a series of name changes, it became Kazan State Institute of Culture. It has a university status and located in the city of Kazan, Russia. Kazan Institute of Culture claims to be the best institute of arts in the Volga region. Students train in various fields of arts in its 7 faculties. Many graduates have become a famous artist and art figure Russia. Another thing, Kazan Institute also takes pride in its involvement for making the Kazan Heritage a UNESCO world heritage site. One of the oldest art universities in Russia, the Moscow school of painting is established in 1865. But the history of this institute goes as far as the year 1749. It’s in constant rivalry with St. Petersburg Art Institute. But unlike its rival, Moscow School of painting is more democratic when it comes to their art. Institute of Arts at Tomsk University specialized in higher musical and artistic education. The university has 600 students studying various art fields such as culturology, concert performing, design, and symphony orchestra. The university focus on their graduate to integrate nicely with sociocultural space in Russia. They also have cooperation with other art institutes, domestic and aboard. Although the faculty was only established in 2001, arts at Moscow University has had a history since the 18th century. The Moscow University Public Theatre was founded in 1756. This theater is the foundation of the performing art in this University. Moscow University is the best university in Russia. Its Art Faculty is definitely among the 8 best universities for arts degree in Russia. Art studies in this university can be studied in 4-year bachelor degree and 2 years master degree, in accordance with the Bologna Standard. Students study various fields to become art experts and professional, art researches, and art creators. Apart from the traditional arts, the university also equips its graduates with knowledge in applied arts. Currently, the university educates around 200 students in the Faculty of Fine and Performing Arts. As one of the high ranked university in Russia, it only makes sense to put this university among the list of 8 best universities for arts and culture degree in Russia. The university offers several interesting programmes in the field of arts. Those programmes are Liberal Arts and Sciences, Graphic Design, Museology and Conservation of Cultural and Natural Heritage Sites, restoration of Fine and Applied Art Objects and Academic Singing. The university also offers applied informatics programme in Arts and humanity. In this field, students will learn about applying current technological advancement in arts and culture, which is very interesting. Russian State Institute of Performing Arts has been persisting as a prestigious art institute in Russia since 1779. Located in St Petersburg, Russia, it is the oldest performing art institute in Russia. The institute specializes in training professionals in theatrical fields. Their educational approach is both classic and contemporary and was prized by its versatility to fulfill the nowadays arts demands. Many top graduates of this institute work in many prestigious theaters in Russia. So those are the 8 best universities for art degrees in Russia. Aside from classical arts such as music, theater, and paintings, there are also the fields of applied arts. To this day the demand for skillful and knowledgeable art graduates is still high. Part of it is in order to sustain and continue Russian’s artistic significance. But on the other hand, universities attempt to keep up with the current day’s standard and demand. Hence why the fields of applied arts are also popular in Russia.